It's Christmas 1997, and Nick and Tom are paying their first visit to the rest of us in Santa Cruz, where we had moved in June 1997. Nick on the beach on a sunny afternoon in late December in the aftermath of a storm the night before. 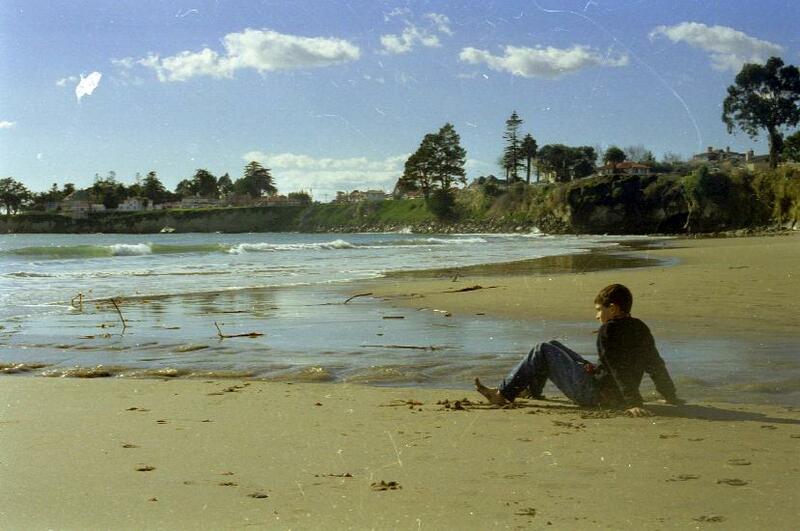 (Here is Tom rock scrambling on another beach during the same vacation). After romping around with the others in the sand, he sat down for ten minutes and watched the waves. We don't know what he was thinking that day on the beach, but remember, it was winter, yet the sun was shining and it was warm enough to play in the sand with no shoes on. Six months apart had been a cruelly long time for the kids, not to speak of their papa. Just before we left France, a judge there who permitted herself to be swayed by her prejudices had taken Nick and Tom away from us and sent them to their mother in Paris. The same judge and her colleagues reversed this error, but it took two years and several court hearings. We speak of "prejudices" because the judge concerned decided to separate us after a very brief review of the facts and against the advice of the four lower court judges who, during years of review and following a court-appointed psychologist's report, had always kept the boys with us. Ian had seen Nick and Tom once before Christmas (remember, we left France in June), because their mother did not honor the court's order that they spend half of that summer with us. Unannounced, in October he collected them outside their school in Paris on the day that their October vacation began. When Nick saw his dad on the sidewalk in front of the school, he cried out: "Dad, it is you, I've imagined so many times that I saw you just like that on the street! Now it is you, it is really you." Not the best of times. Every cloud has a silver lining. In this case, more than one. The court in France returned the boys to us in large part because the judges were distressed by the kind of cruelty to the boys that was manifest during that difficult six months. Not only were they abruptly and unexpectedly taken away from the father whom they had lived with for their entire lives, but also they were not allowed to visit as the court intended, making the rupture that much more keen. While there is much talk about deadbeat dads and other paternal sins after divorce, there is not enough attention paid to mothers who use their children to get even for their fathers' wrongs. These mothers merit as much disdain and social sanction as do deadbeat dads. The other silver lining was that during this first visit, everyone went out of their way to ensure that Nick and Tom had a great Christmas. On the left, Antony (here's his wedding) and Laura Nash, their cousins, with all our older children on Christmas day 1997. There was the regulation stack of presents at home (see Christmas), and at the Nashes and Hanlons, they all got thoughtful presents too. In short, everyone spoilt them rotten, which did them no harm at all. 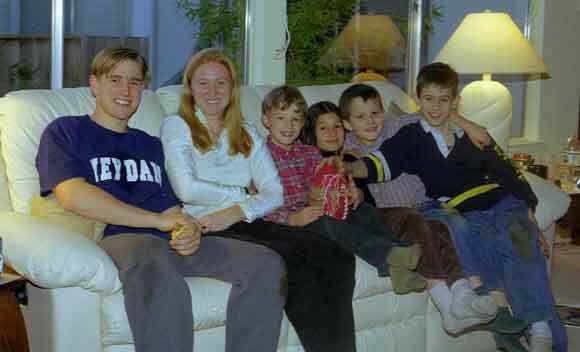 Annie Hanlon took the one to the right of the Santa Cruz contingent of this temporarily un-blended family, at Russ and Annie's house in August 1997. 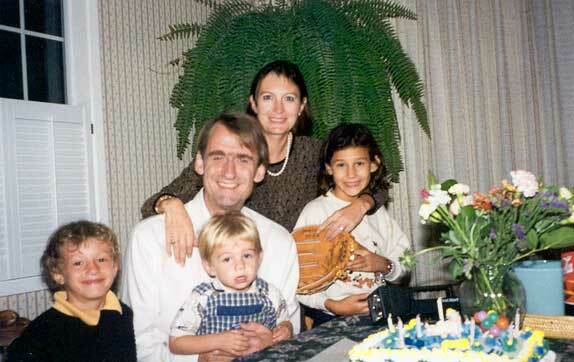 There is a portrait of the four children before Nick and Tom's return to live with us here. Finally, we would like to applaud the work of Michel Thizon and the Association he founded in France, SOS Papa. He and they work tirelessly to overcome the prejudices (principally a sexist bias that permits children to be separated from their fathers simply because they are not mothers) that make the legal system in France and elsewhere in the West a tool for depriving children of their fathers. 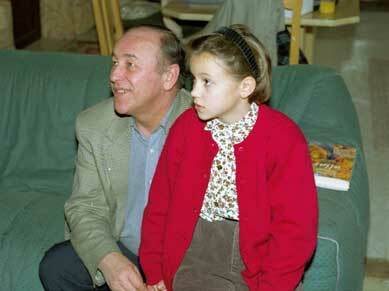 Michel Thizon with his charming daughter Marine, during an all too brief visit with us in late 1995. You can see his compassion in this photo. Michel Thizon has pounded away for years on end at the powers that be, and the results of these efforts can already been seen in the French divorce courts and even in the French legislature. It is indeed possible that without Michel and his ilk, this family would never have seen the light of day together. As it is, Evelyne Sullerot, a prominent French sociologist, estimates that the number of children being raised in France without significant paternal contact is one or two million. Very few are trying to remedy this tragic and dangerous social ill.
Bravo Michel! Bravo SOS Papa! Keep up the good work.  Here they are: http://www.sos-papa.net/.